Every day, Scouters refer to the BP&P – our By-law, Policies and Procedures – for guidance on Scouting activities such as camping, fundraising, membership and safety. Our current BP&P has been through multiple revisions – sections were created in response to legal, social and other changes; different people wrote different sections; and in many places, procedures are mixed with policies. As a result, instructions can conflict from section to section, language can sometimes be confusing, and the overall document is difficult to update and manage. Parts of BP&P are out-of-date and don’t meet Scouters’ needs,” said Richard Thomas, Chair of the Board of Governors. “To help improve BP&P and make it work better now and into the future, we’d like to hear feedback from Scouters like you. We want to make BP&P more streamlined, accessible, understandable and useful to all readers, particularly Council, Group Support Scouters and all Section Scouters. What is the difference between policies and procedures? Policies are the why of something, and procedures are the how of something. For example, our fundraising policy talks about why fundraising is important to our success and our fundraising procedures outline how fundraising should be planned, managed and evaluated. Policies and by-laws are the responsibility of Scouts Canada’s Board of Governors to manage and update. Procedures are ultimately the responsibility of the National Key Three. Both policies and procedures need to be clear and actionable but, policies are intended to last while procedures often need to be updated in response to changes at Scouts Canada. That’s why procedures need to be separate from policies. Who’s Managing the BP&P Review? 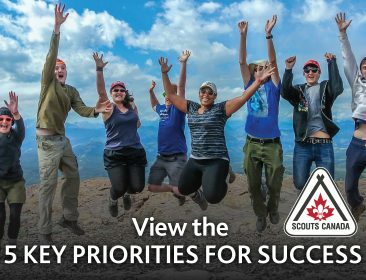 Scouts Canada’s Executive Director of Special Projects and the Board’s Governance Committee are working together to review and rewrite Scouts Canada’s policies, and consult with members. The Executive Director is also managing the process of updating Scouts Canada’s procedures with management, staff and other experts. Member participation and feedback is key to the success of this project. We are making it easy for you to review and provide comments on draft policies as they are updated. You will be able to participate in the consultation process by online survey and telephone. We recognize that not everyone is concerned about every policy. So, we will do our best to make it simple to review and comment on individual policies. Consultations began November 18, 2017 at the National Conference in Toronto. Check the BP&P Review Project web page for updates including links to the online survey and a schedule of consultation opportunities. We will be gathering feedback in January and February 2018. Don’t miss your chance to participate! For policy and procedure feedback, please be sure to use one of the available consultation options as they come onstream. If you have any questions, or want to know more about the process, please email bpandpreview@scouts.ca.